Little is known at this time about Rusty Ruben and his Radio Gang other than an advertisement in a Mankato, Minnesota newspaper for a personal appearance at the State Theatre in September of 1939. Back then, movie theatres would often book other entertainment as part of the movie billing. On this occasion, Rusty and his Radio Gang were going to be appearing on a Sunday through Tuesday, September 10 - 12, 1939. The ad mentions continuous shows, with the doors opening at 2:00pm. The ad mentions that folks had heard "...this whirlwind barnayrd jamboree on the air, Now see the whole darn gang - In Person!" In our research we found that Freddie Stone later went on to play with Woody Woodell and his Riding Rangers for a time when Woody was on radio station WPIC in Sharon, Pennsylvania. This was around summer 1946. Also in Woody's band at that time was Curley Phillips on the electric Hawaiian steel guitar. The article noted that Curley and Freddie had just joined the act. The movie at the Grand Theatre was "Hell's Kitchen" featuring the Dead End Kids. The price of admission to the show, before 3:00pm was just 25cents. After 3:00pm, the price of admission was 35 cents. But kids, were always 10 cents. 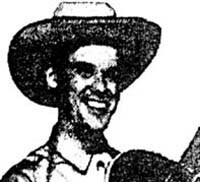 Hillbilly-Music.com wishes to express its appreciation to Ron Affolter (Lonesome Ron) for sharing the results of his research in local musical history and the copies of the articles and ads.